Here comes another new series! I have enjoyed my work and play series so much, and have thought about adding this budget-topic for awhile now, too. Now is as good a time as ever to start finding dupes for popular styles, thus the title “Want this? 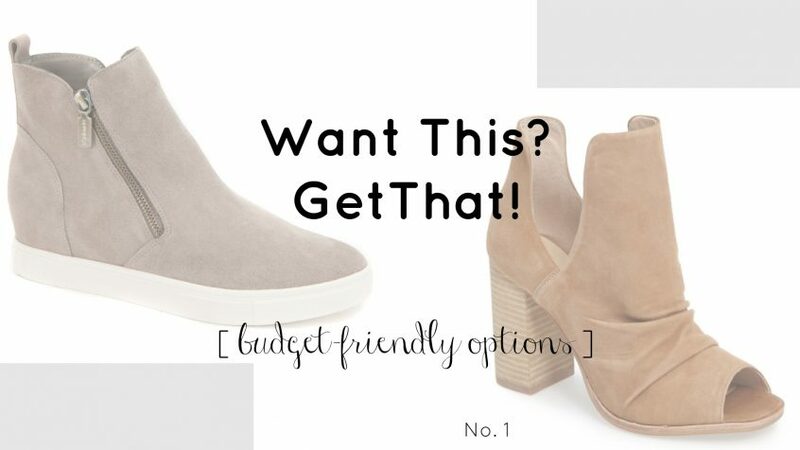 Get that!” where I’ll be sharing budget-friendly shoes, jackets, bags, and more as I round up popular looks this fall. The Nordstrom Anniversary Sale and a recent stop in Payless is what started me on today’s “want this / get that” topic: Fall Shoes and Teacher Totes. Many of these styles are trending right now, and I’ve had my eye on the more spendy pairs dozens of times. I found quite a few dupes that are really good, and many of them come in more colors, too! Click any image below to browse. The school year will soon be gaining momentum, and as a teacher I already hunted down a budget-friendly tote! I was SO excited because when I walked into Payless, there was a perfect reversible tote (pink and tan) with a little pouch attached on CLEARANCE for $15.00. Best part? It fits my laptop! Can’t beat many of the prices I found below, too! Click on any image below to browse. Let me know what you think of this new series, and if there’s anything you are on the hunt for that I can help you find! So glad you like it! Thank you, Helaine!! 🙂 Hope to do more, so let me know if there’s anything you’re ever looking for in a certain price range!